When it comes to running the ball successfully in all levels of football – but especially the higher up you go – it requires execution from everybody involved in the play. An electric running back is going to be capable of masking occasional mistakes from the guys up front but, often, all it takes is for one blocker to fail on their assignment for a play to end up going nowhere, or even backwards. This year’s PFF award for best run blocker is going to a second-year offensive tackle who rarely failed on his assignment. He went out there play after play and did his job and then some. That player? New Orleans Saints‘ Ryan Ramczyk. There were 41 offensive linemen this season who were on the field for at least 400 run-blocking snaps. Among that group, nine of those linemen received a negative PFF grade on fewer than 10% of their run blocks, with – you guessed it – Ramczyk leading the way by receiving a negative grade on just 6.9 percent of his run block attempts. Ramczyk’s ability as a run blocker wasn’t just limited to “not getting beat” either. He made plenty of impact blocks, as well. Among those 41 linemen to see at least 400 run-blocking snaps this season, the NFL sophomore out of Wisconsin ranked eighth, receiving a positive PFF grade on 11.6% of his run-blocking snaps. When we subtract negative run-block percentage from positive run-block percentage among those 41 linemen, just 11 of them have a positive difference, with only five linemen having a difference greater than +1.0 percent. Ramczyk leads all linemen with a difference of +4.7%. Ramczyk didn’t really have any weaknesses either when it came to what kind of run he was blocking for. He graded as a top-10 run blocker among all offensive linemen on both outside and inside zone runs, and he led all linemen in run-blocking grade on gap runs. The former first-round pick graded well on combo blocks, pull blocks and he was good when he was left one-on-one with a defender with no obvious shade advantage for him to work with. He was as complete a player as there was when it came to run blocking this year. The Saints averaged 4.3 yards per carry as a team this season, that average shot all the way up to 5.4 yards per carry when they ran the ball off their right tackle. 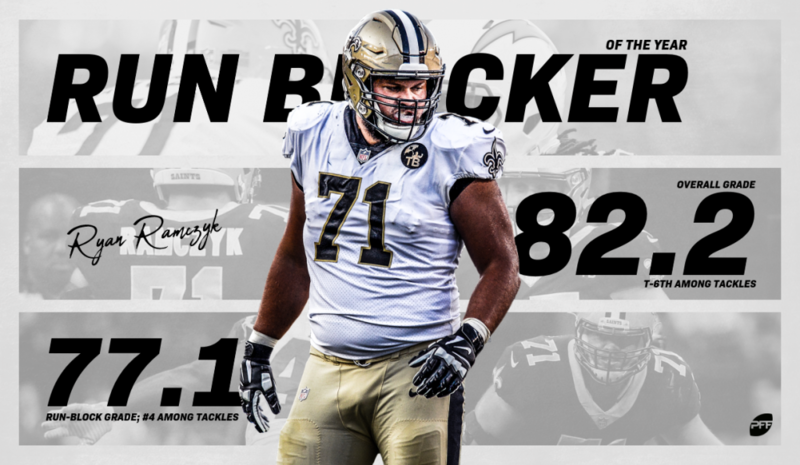 Any way you slice it, Ramczyk was a complete force as a run blocker this season, which is why we are naming him the NFL’s best run blocker of 2018.